May Dugas stands on trial in May of 1917. She is a charged with extortion and the residents of her tiny hometown have shown up in droves to determine if their most infamous resident is innocent or guilty. They are fascinated by the hometown girl who climbed through society to become a baroness, only to be brought down by a close friend who claims that May used her for her fortune. May appeals to the jurors, believing that truthfully telling her entire story will result in her exoneration. This book has a sweeping reach. Readers follow May from the small town of Menominee, Michigan to Chicago and then to San Francisco, New York City, London, and Shanghai. Each location is created with precise attention to detail and it's really fun to see the differences between high society in different parts of the world. It is interesting to read this story and try to determine which parts of the story are history and which are details created by Biaggio. While this book is a quick read, I found myself very disappointed. For a book that centers on "the most dangerous woman in the world," as the Pinkerton Agency dubbed her, she is a surprisingly flat character. We never really get to know her and she seems to have no reaction to things that would radically alter our lives. When May first moves to Chicago, circumstances force her to become a prostitute in an infamous brothel. For a small town girl who has only had one serious relationship, the reader might expect some major ramifications. Instead, May seems to brush off the fact that her life has changed in an irrevocable way and we get no reaction from her. Perhaps Biaggio means us to feel that we are being played, just like the other characters in the novel. But it leads to a flat reading experience. I wanted more from the Pinkerton aspect of the story too. I chose to read this book, in part, to find out more about those detectives and how they worked. Reed Dougherty manages to track May all over the world and thwart her at almost every turn. But because we only see him through May's eyes, he seems more like a plot device than a character. He is either a man who is truly committed to his job or someone who has a serious interest in Ms. Dugas. But we never find out - Dougherty shows up, ruins May's carefully constructed plans, and then is gone. 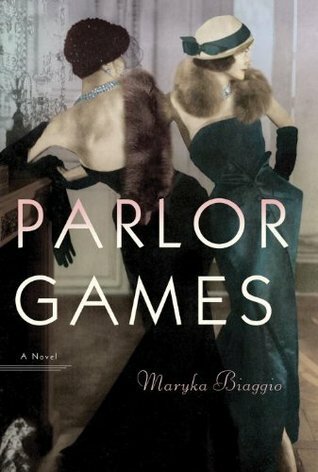 Parlor Games is based on a real woman who did break out of the social confines of her time and was acclaimed as one of the most glamorous women to ever walk the halls of high society. She was also a woman who went to trial and may have been guilty of extorting an untold number of people. But reading this book didn't create the desire for me to find out more about this woman. It never progressed from a sequence of events to an examination of an infamous person in American history. Yup. I felt the same way you did about this book. I haven't seen a good review of this one yet. The storyline and cover art are so interesting it's really a bummer it wasn't better. It seemed so promising, but it just didn't work. Oh well.